Here is the first version of the T-shirt that is really hip. Please post your comments. I like the overall design of it Ned but I don't think the punchline really fits in. I think one of Tokai's strengths when they advertised in the past was brevity and simplicity. Keep the top line, keep the picture and move the 'Tokai' logo to the bottom instead of the 'Rock with Tokai.' 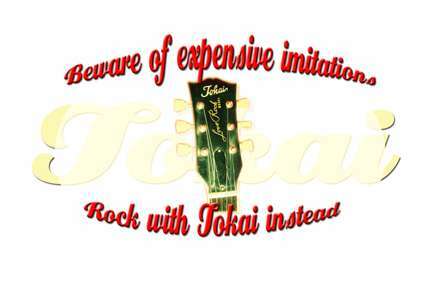 If you feel that leaves too much space in the middle keep the Tokai logo across the middle and turn the headstock sideways at the bottom - I would assume my fellow Tokai fans do not tuck their t-shirts in. I will order one anyway, whatever you decide in the end. Good luck with it all, TommyR. Shouldn't the text be "Beware of expensive originals"? Ok, I get it, it's the same with the strat's isn't it? When Tokai started to manufacture their excellent 50's and 60's strat/tele replicas Fender didn't have any. It's kind of a play on words thing. The "Beware of Expensive Imitation" was what had the most votes on the slogan poll - only 4 but then again if you didn't vote you can't complain. I think the " Beware of expensive imitations" is enough...if they don't get that then they never will. I agree with the comments of keeping it simple (no I'm not just being biased - honest!) for all of the reasons given. My only other comment is: will there be a strat style headstock as well - one for the springysound/breezysound lovers. I'm an out and out LR fan so put me down for a T shirt when ready! Working on replacing the headstock with a Love Rock body. After that we'll go with a strat or tele body. Just wanted to get the general idea out to everyone. I think its great the way it is. I wouldn't replace the headstock with a body design, but you might consider a "SpringySound" or BreezySound" headstock later on to please all Tokai owners. Excellent play on words. Nice job! I like it too, but I agree, it doesn't need the last "Rock with Tokai" line. By the way, I always tuck t-shirts in!! I haev been away for a bit ... do you have a price for them yet?